ready For More Impact? Results? Clients? You likely know that the success of your business depends on your ability to get new clients. It doesn’t matter what impact you’re having, you need new clients and you need them consistently if you ever want to grow and scale your business. You don’t just need more clients, you need your “perfect clients”. These are the type of clients that would love the opportunity to work with you. They see your true value, they see you as being unique and one-of-a-kind. They’re the type of clients that want results and their willing to put in the work to get high level results. 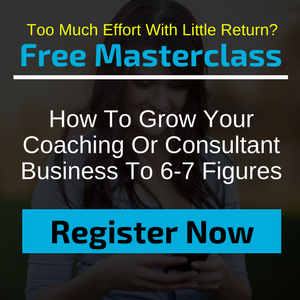 Without a consistent system to bring in your new clients, your business is in trouble. (1) You’ll never be able to grow and scale your client business. (2) You’re losing a TON OF MONEY without a reliable way to attract and enroll clients when you want. (3) What about your freedom? An escape from wearing all the hats in your business? I want to show you how to fix it, just how simple it is to do and explain how you can hit any revenue goal you want. Nearly all of the ways you’re trying to attract new clients RIGHT NOW simply doesn’t work. For decades, experts have told you to create blogs, create video, do podcast, try this funnel and that. Have you ever wondered why this doesn’t get you new clients? While these are fine when you’re building an audience, they rarely result in new clients for you. That’s the key you have to understand, there’s a big difference in growing your audience vs growing your income. We teach our students how to use our proven step-by-step process that includes all the marketing strategies, technical support and motivation you’ll ever need to see big transformations take place in your business. We’re glad that you’re here and want to show you how we do it. You can check out our Results page to see who we’ve helped and the revenue levels are students are hitting. When you’re ready, check our training below to learn the process we use to help our clients create 6 figure and 7 figure businesses. This will be the best 60 minutes you spend on your business in 2018. Learn exactly how we’re making an impact in so many lives. Yes! I Want To Know How! These men and women are incredible and are making big impacts in the world. See the transformations that are taking place.